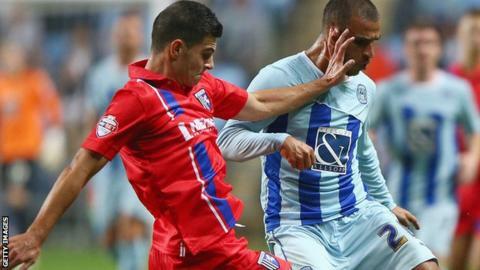 Gillingham defender John Egan hopes he can build on his current form following his summer move from Sunderland. The 21-year-old has been an ever-present in the league for the Gills. "One of the reasons I came here was that I wanted to play every game and show people what I am capable of," he told BBC Radio Kent. "I was lucky enough to have earned my place in the starting XI in pre-season by playing well and I'll try to keep getting better every game." He added: "The manager [Peter Taylor] said 'if you come here you'll get a chance' and that he believed in my ability. "I'm personally very happy with how I'm playing and how I've gelled in with the lads and the team." "If you look throughout the team it is a very young team. Hopefully we can repay the faith throughout the season and push as high up the table as we can." Egan, a Republic of Ireland Under-21 international, came through the youth ranks at Sunderland, but left the Stadium of Light after failing to make a senior appearance. However, he says that loan spells away from the Black Cats - with Crystal Palace, Sheffield United, Bradford and Southend - helped his development as a footballer. "I'm only 21 but I have been to a few clubs already," he said. "I think when you're young and at a big Premier League club like Sunderland, if you are not playing in the first team you need to get out on loan. "You want to play at three o'clock every Saturday and playing in the big leagues. "A few of my mates up at Sunderland are very good players but haven't had that break. It can be hard after that." Taylor guided Gillingham to 17th place in League One last season and has set his players a target of a mid-table finish this term. The Priestfield Stadium outfit have taken seven points from their opening six games of the campaign and Egan believes they are improving with each match. "If you look throughout the team, it is a very young team and he [Taylor] is not afraid to throw young players in," the Irishman said. "We are learning a lot and playing different systems. "Everyone on the pitch has to be a leader and take a bit of responsibility. That is something we are trying to get better at every game. "Hopefully we can repay the faith throughout the season and push as high up the table as we can."